Following up on the delicious fun we had brewing and sharing Requiem for a Pancake and One Love – Imperial Stout Aged in Jamaican Rum Barrels, our first and second Brewhouse One Series releases, we’re excited to announce that it’s almost time to share another new, special beer with you, our friends and neighbors! Dating back to 2010, our brewing team has long loved the effects imparted by aging a big, tawny rye beer in rye whiskey barrels. 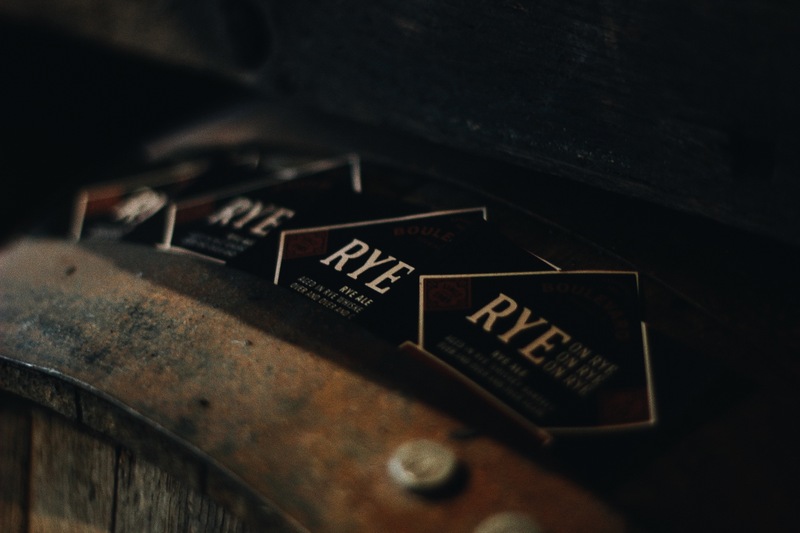 Rye on Rye, our first release that was aged exclusively in freshly-emptied Templeton Rye barrels, lead us to brew Rye on Rye X – Sazerac and ultimately, Rye on Rye on Rye, a double barrel-aged version of Rye on Rye. Never content to say, “Enough is enough” our brewers have taken things one (possibly final yet crazy delicious) step further with the exploration of Rye on Rye and we’re excited to share that Rye on Rye on Rye on Rye will be our next Brewhouse One Series release. Pouring deep garnet in color, Rye on Rye on Rye on Rye pops with aromas of spicy, fruity rye malt and massive notes of rye whiskey, vanilla, toffee and charred oak. Certainly warming at 15.5% ABV, Rye on Rye on Rye on Rye is of medium body offering chewy caramel/toffee malt character balanced by earthy, herbal, citrusy Styrian Golding and Citra hops that give way to sweet, spicy rye whiskey character in a slow sipper that blurs the line between beer and whiskey. Rye on Rye on Rye on Rye is 100% barrel-aged. Rye on Rye on Rye on Rye will be available exclusively at the Boulevard Tours & Rec Center during a ticketed bottle release party on March 11th where attendees will have the option to purchase up to four additional bottles of this latest Brewhouse One Series release for $12 each. Individual 12oz bottles will go on sale to the general public at 10am on Monday, March 12th in our gift shop with a limit of four bottles per person. $1 from every bottle of Rye on Rye on Rye on Rye sold will benefit Rose Brooks Center and the work they do to break the cycle of domestic violence so that adults, children, and their pets can live free of abuse.